In a recent NY Times article about online dating, Emily Ladau described having a date at a painting night. She researched the location which was a wheelchair friendly restaurant and he bought the tickets. They looked forward to an evening of paint, brushes, wine, and romantic possibilities. It turned out that the painting class was in a room above the restaurant and that was not wheelchair accessible. The evening was spent listening to other people having a wine-fueled fun time upstairs while Emily and her date spent the evening having an uncomfortable conversation downstairs. You can’t always be sure how wheelchair accessible the location of your date will be. Making your home more accessible is something you can do, however. 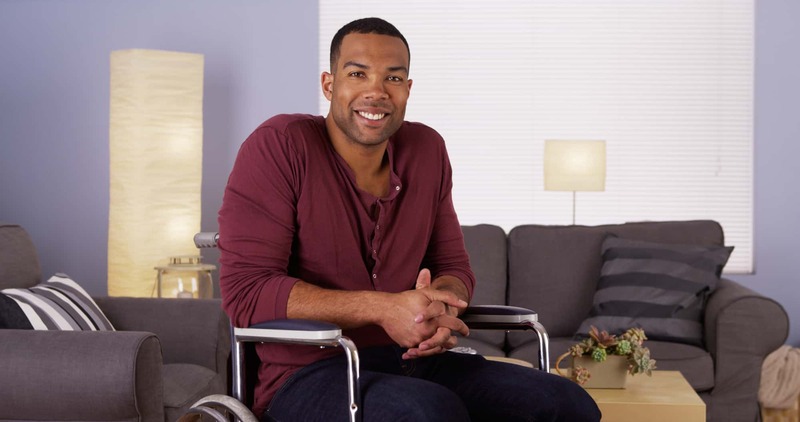 Read on for 5 ways you can make your home more wheelchair friendly. Install a wheelchair ramp and make getting into your home easy. You need to ensure that both the path to the ramp and the door is wide enough. Handrails and non-slip surfaces can be useful features. If space is short, consider a U shaped ramp. Concrete and aluminum are good materials if low maintenance and durability are important. Wood can be attractive but needs maintenance and can be slippery when wet. Carpets and rugs can be attractive but are often not wheelchair friendly. Hardwood flooring or tiled floors offer durable and snag-free solutions. Short pile carpets can also be a good compromise. Use rubber ramps to transition between rooms and protect threshold fittings. Stairs are the most obvious obstacle to access that wheelchair users face. A verticle platform lift or stairway lift can overcome this. When user-operated they provide independent access to multiple floors. Some thought put into the bathroom design can make a great difference to wheelchair users. Enlarge the doorway to at least 32 inches. This may not be enough if the hallway is small. In this case, allow room for turning. Use a wall mounted sink rather than a vanity unit to allow clearance for your wheelchair. Have the height customised for your needs. Adjusting the height of the toilet and installing grab bars to make access to the toilet easier. There are many bathing solutions including curbless showers, walk-in tubs, and built-in seating. The addition of grab bars helps make independent safe bathing more achievable. Look at the layout of the kitchen. Allow room for a wheelchair to move around between countertops. Lowering countertops and space underneath countertops can give access to the sink and other work surfaces. Move electrical switches to make them accessible. Oven doors with pull-down doors can be awkward for wheelchair users but side opening doors are available. Rotating shelves that work like a Lazy Susan can make cupboards more practical and bring kitchen utensils and groceries within reach. Taking time to, enjoying your home is something we all want to be able to do. Making some adaptations to your home to make it more wheelchair friendly can change your life. Independence, comfort, and accessibility in your home make a difference to the quality of your life. To find out more about access and mobility in your home contact us today!